It is a beautiful, sunny day outside, but don't let it fool you. Temperatures are currently hovering around 31 degrees at just after 12 noon. We had some early morning snow flurries. Didn't amount to much though. 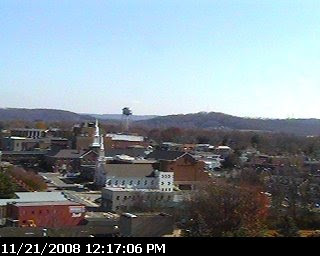 Nice view from the Cookeville Webcam! Temperatures will begin to moderate as we head toward the Thanksgiving holiday. We will, however, have to get through tonight where lows are expected to settle into the mid and lower teens. I've survived dental surgery...thanks to some excellent pain-killing medications! Thank you Eddie...I am surviving...thanks to strong painkilling medication.